I met a friend for lunch today at The Happy Ending Bar and Restaurant on Sunset Blvd. in Hollywood. It's a huge sports bar but don't let that fool ya - it has a surprisingly gourmet menu with generous portions, plus a snarky sense of humor on its fun menu. The menu concept is a gourmet take on "global comfort food," according to its website. The exotic global comfort food items range from Maine Lobster Soy Paper Summer Rolls to Filet Mignon Sliders on freshly baked pretzel rolls with Chipotle Cream and Wasabi Fries. They also have New York style pizza - which I didn't try this time around but am curious to go back and grab a slice or two. But to the business at hand - MAC and CHEESE. They serve this dish called "Thee... Mac and Chee!" It is described as having gruyere, cheddar, mascarpone and crimini mushrooms. I ordered it - it came out in a lovely white ceramic baking dish. It was a large portion for what is considered more of an appetizer than full entree meal, so the $11 price was quite economical. Thee... Mac and Chee! passed the Paula Parmesan test for a good mac and cheese. My three rules? 1. The cheesy sauce must be thick and not runny. Check. I think the mascarpone helped create a very gooey and velvety texture to the sauce which had a sweet and yet slightly nutty flavor. 2. The macaroni should be cooked al dente and the perfect size to hold the gooey cheese. Check. The macaroni were large, one-inch sized tubes which oozed cheese. Yummy. 3. You can never overdo it with the cheese. Check. When I dug into this dish, strands of stringy, melty, yummy cheese hovered delicately in the air. Mmmmmmm. The dish also had a nice bread crumb crust on top. The Gruyere cheese had a lovely buttery, nutty, and salty flavor to it. The cheddar added a sharper flavor, making the dish more complex. And the mascarpone helped create a silky and creamy sauce, plus a hint of sweetness to the dish. Now, what about the mushrooms? Well, I normally am very conservative about my mac and cheese. i don't like extra things, like onions, mushrooms, or anything that isn't milk, cream, butter, and cheese. I don't even care for bacon in my mac and cheese because I'm also a carbonara fanatic, so I'd rather have bacon in that. Hmmmmm, future new blog? LOL! The "I'M CRAZY FOR CARBONARA!" BLOG! But the crimini mushrooms worked here. They were sauteed perfectly - they had a slightly firm texture but were still juicy on the inside. 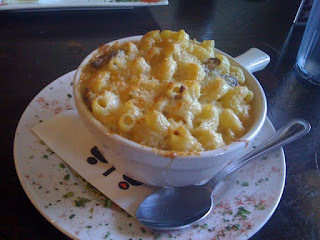 There were only a few slices in my dish, so the mushrooms did not overpower the Mac and Cheese flavor. It was more of an accent than an ingredient, and I was happy with this perfect balance of earthy mushrooms and nutty gruyere, tangy sharp cheddar and sweet mascarpone. Overall, a hearty, straightforward Mac and Cheese with a gourmet twist with the use of plenty of Gruyere cheese. One odd note - somehow, the combination of these cheeses actually created a Parmesan Reggiano flavor - perhaps it was the nuttiness of the Gruyere that created that illusion. I need to work out because this blog is going to cause me to gain ten pounds by next week. Ah, the sacrifices I will make in the name of mac and cheese!